Many times, the Battle of Waterloo has been written about as though it had occurred in a vacuum. The battles that took place two days before, Quatre Bras and Ligny, are maybe slightly mentioned. In actuality, the battle of Waterloo can only be understood if one looks at Napoleon's and the Allies' strategy and plans, and the battles that took place earlier. The twin battles of Quatre Bras and Ligny , fought on June 16, 1815, are the catalysts for the end of the first empire at Waterloo. Of these two battles, Ligny is by far the one that held greater promise for Napoleon. If Napoleon had won a great victory and crushed the Prussians, they would not have been able to help Wellington on June 18th. It is possible that with a rout of the Prussians, Wellington would have had to retreat further without the promise of Prussian help. On the field of Ligny and the Prussian defeat were sown the seeds of the Allies' victory at Waterloo. 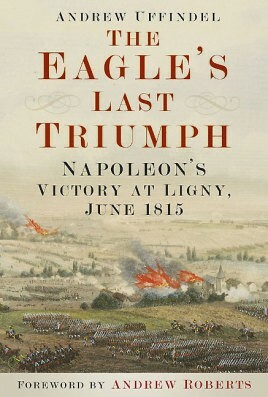 'The Eagle's Last Triumph' by Andrew Uffindell is one of the rare books written about the battle of Ligny. It was originally published in 1994, and the hard cover copy from then is not easy to find. Casemate publishers has put out a paperback edition, and it is well supplied with maps and sixteen pages of black and white photos. The book even goes into the battle of Quatre Bras, and the end of the campaign. Part two of the book has an analysis of the battle, and a breakdown of the losses both sides suffered. It also has a guide to the battlefield today for anyone who might be interested in taking in the actual battlefield's scenery. The battle of Ligny, when it is mentioned, is usually written off with a paragraph or two. The traipsing of D'Erlon's corps is most often dissected down to the minute. D'Erlon's summer hike from battlefield to battlefield without influencing either is truly one of history's enigmas. If he had pitched into the Prussian right flank, as the emperor ordered him to do, the battle of Ligny would have turned into a rout for the Prussians. As a consequence, the Prussians would have had to retreat east instead of north, and still parallel with Wellington's army. The large and consequential battle of Ligny was not a foregone conclusion. As the book shows, it was a titanic struggle between the French and Prussians, and every bit as horrific and glory filled as any other Napoleonic battlefield. This was the last time that the Imperial Guard would march forward to seal a victory. The grenadiers of the Guard were told by their second-in-command, Lieutenant-General Francois Roguet, "the first man who brings me a Prussian prisoner will be shot". This is much like Blucher's supposed statement at Waterloo "no pity, no prisoners; I will shoot any man I see with pity in him". It might just be a quote from a movie, but it echoes his and his soldiers thought about the battle of Ligny. This terrible hatred between German and Frenchman would only be quenched a hundred and thirty years later in 1945.